to do something in the easiest, cheapest or quickest way, often by ignoring rules or leaving something out especially at the expense of high standards. What is the origin of this idiom? to cut a corner or corners : to pass round a corner or corners as closely as possible; fig., to pursue an economical or easy but hazardous course of action; to act in an unorthodox manner to save time; also, to act illegally. Their first quotation is 1869 (see ghoppe's answer). When hunting hare with greyhounds, both a good hound and a good rider will never cut a corner. Plenty of examples can be found in the 1850s and 1860s. Follow the line that the hounds are taking, never cut corners unless well behind where the hounds are working. Put simply, lure coursing is a simulation of the chase. Two or three hounds of the same breed, selected by random draw, line up at the start line and, on the signal from the Huntmaster, are simultaneously "hand-slipped" by the handlers. The dogs follow an erratic course and are judged not only on speed, but on enthusiasm for the lure and the chase, follow (chasing directly behind the lure and not cutting corners), agility (cornering ability, sure-footedness, etc. ), and endurance (not running "out of gas" at the end of the course). Did blue win? Or yellow? Or pink? Certainly if we scored these athletes according to who reached the finish line first, then blue was the winner, but consider this: these are lure coursing sighthounds, canine athletes. There are many aspects in scoring lure coursing, not just who gets there first. These are broken down in five categories--speed, agility, follow, endurance and enthusiasm/overall ability. The judges must not only assess a value for being first to the finish line, but how did the hound get there? Did the hound cut all the corners or run up the middle of the field to intercept the lure or did the hound follow the lure on every curve and straightaway? Pink was the winner. Why? Look again at our scenario. Blue led out but cut a corner to keep up with pink, yellow cut the corners, and pink passed blue twice, even after blue cut the corner. Blue had more speed at the end therefore was not running at his top speed over the whole course. Yellow did not run the entire course. Pink had the speed to pass blue during the mid-course, on the straight and more than likely would have finished ahead but pink was beginning to make the stop since he was ahead. Blue took the lead because he was 2nd place coming in and had to use the speed burst to grab the "prey<" first. Pink ran the entire course with good follow, speed, agility and endurance. Blue did not use his power and speed till the last push. Yellow was off-course most of the way. Thus, Pink wins. I presume hounds are not meant to cut corners as they should follow the hare at a "respectful distance" to tire it out rather than catch it. And riders shouldn't cut corners so as to remain far back enough from the dogs so as not to distract them. Cutting corners results in a less than perfect hunt. "It's a metaphor from driving - not necessarily motor driving, because it also applies to horse-drawn carriages. When you come to a sharp turn in the road, instead of going all the way to the corner and then turning, you can go diagonally across, and "cut the corner off". This saves time, but entails a risk of clipping the kerb and overturning, or being involved in a pile-up with another vehicle. Thus "to cut corners" means to discard normal safe practice in order to get fast results." Sir: Ann Hales (Letters, 1 July) asks after the origin of "to cut corners", in your earlier headline "Nemesis of the golden boy who cut too many corners". The OED documents the phrase from 1869, when Mark Twain described a gondolier who "cuts a corner so smoothly, now and then, or misses another gondola by such an imperceptible hair-breadth that I feel myself `scrooching', as the children say, just as one does when a buggy wheel grazes his elbow" (Innocents Abroad, chapter 23). The original use was, therefore, "to pass round a corner as closely as possible"; the modern extended use is recorded from the latter end of the 19th century. So the original use of the phrase was "to pass round a courner as closely as possible". It's pretty obvious that to do so at a high speed to save time is reckless and dangerous to passengers. From there it's easy to see how the metaphor was extended to encompass any behaviour that may have been done to save time or materials but in the end may not be the safest or wisest route. Another possibility comes from here. 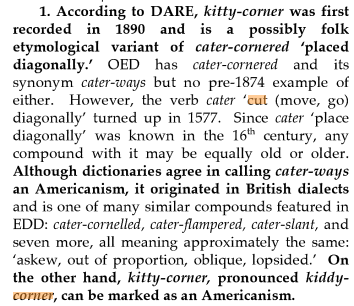 According to An Analytic Dictionary of English Etmology by Anatoly Lieberman, the phrase cutting corners may have derived from "cater corner." In the 16th century, the verb cater was first recorded and defined as placing something across or diagonally. This term was later reduced to "catty corner" and then to "kitty corner." Eventually the term became simply "cutting corners." The above screenshot came from here. I don't know about the driving metaphor. When driving you do not actually, physically cut any corners and it seems like a contrived explanation. While it is the meaning given in most search results for the origin of the phrase, I have found no references for the etymology and it seems to be the opinion of whoever posted it. In the case of the phrases.org.uk page given by @Zibbobz, that was user R. Berg whoever that is. However, no evidence is given to support the idea and the opinion is not sourced. It does look convincing since it is the first thing one stumbles upon when searching and is on a respectable site. It is not, however, one of the authoritative articles on the site, but a simple post on its message board. As such, it should be taken with a pinch of salt. This comes from the EARLY metal roofing trades. Cutting corners (literally) instead of double seaming / folding every seam. Obviously, anything from wiki.answers should be taken with a huge pinch of salt but the explanation makes sense and is, at least, a link to a literal use of cut which seems to better explain the metaphor. EDIT: Despite this being the accepted answer, I think @Hugo's answer conclusively proves that the origin of the term is indeed the idea of moving quickly around corners. To cut has a meaning which means to traverse across something, particularly by taking some inappropriate path ("The boys cut across the flower bed to the neighbor's yard"), or with effort, skill or agression ("cut through the crowd"). So "cutting corners" is not an idiom; it is rather a straightforward metaphor. Saving time or material instead of doing a proper job of something is analogous to driving on the opposite side of the road, or off-road, to shorten a corner. There is a short-term gain in saved time or cost, which comes at the cost of bad quality or risk (analogous to the damage done by cutting corners, or the risk of an accident). What's the origin of the idiom “get bent out of shape”? What's the origin of the idiom “bust one's chops”? What's the origin of “rob someone blind”?